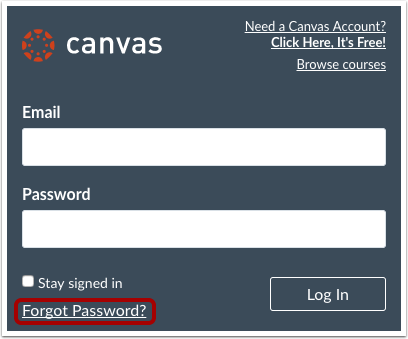 If you created your own Canvas account, you can reset your password through a link in the password request email. If your login credentials were provided to you by your institution, you may not be able to reset your Canvas password on your own. Additionally, if you log in to Canvas using your institution's authentication system, you may need to reset your password using your institution's website. If you request a password reset and the email does not have a password reset link, it will include your Canvas email address and the institution that provided you with your password. To change or verify your password, contact the system administrators at your institution. A password reset email may take up to five minutes to arrive in your email inbox. Password reset emails expire after two hours. 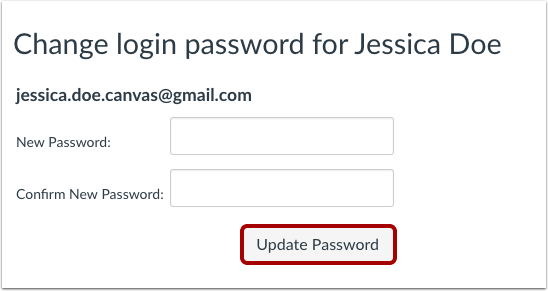 If you can log in to Canvas and want to change your password, you may be able to change your password in the User Settings page. If you enter your email address and never get a password reset email, review the following password tips. Have you typed your email address correctly? Sometimes email addresses can be misspelled. Are you accessing the correct Canvas URL? You will not get the reset email if you are trying to reset your password on a site where you are not enrolled (such as canvas.instructure.com instead of myinstitution.instructure.com). Is your Canvas email sponsored by your institution? If your mail email address is part of a campus firewall system that blocks emails from mass senders, you won't be able to receive the email. Contact your institution's IT department for assistance. Are you the owner of your email address? If your email address is owned by someone else and you can't receive email for that address, you won't be able to get the reset email. Contact the owner of the email address for assistance. In a new browser window, open to your Canvas login page. Click the Forgot Password? link. Note: If your login screen does not show the password reset link, contact your institution for assistance. 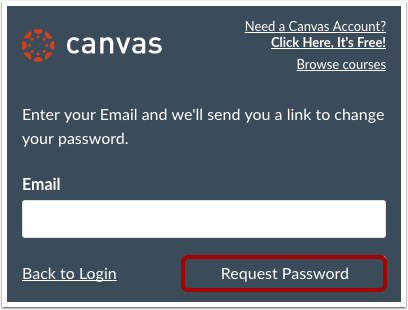 Enter the login information associated with your Canvas account and click the Request Password button. Note: The password reset field verifies password reset information by user login. Depending on your institution, login information may vary. If your user login is associated with multiple email addresses, password reset instructions will be sent to each address. Click the Click here to set a new password link. Type in a new password and then confirm that password by typing it again. Click the Update Password button. With your login credential and new password, log in to Canvas. Previous Topic:How do I change my default email address in my user account as an instructor? Next Topic:How do I add a text (SMS) contact method in Canvas as an instructor? Table of Contents > Profile and User Settings > How do I reset my password as an instructor?